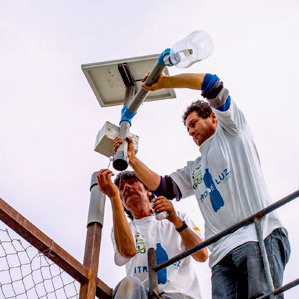 Through a network of partnerships around the world, Liter of Light volunteers teach marginalized communities how to use recycled plastic bottles and locally sourced materials to illuminate their homes, businesses, and streets. 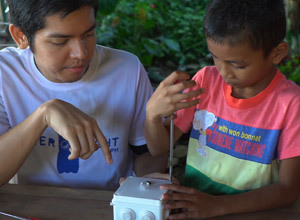 Liter of Light's open source technology has been recognized by the UN and adopted for use in some UNHCR camps. Liter of Light is the proud recipient of the 2016 St. Andrews Prize for the Environment, the 2015 Zayed Future Energy Prize, and a winner of the 2014-2015 World Habitat Award. Liter of Light Philippines is a registered 501(c)(3) charitable organization committed to telling the story of more than one billion people around the world who suffer from the debilitating effects of energy poverty. Our chapter coordinates and supports the global work of Liter of Light while developing educational programs to promote engagement and participation. Through social media and community replication, our movement has spread; 145,200 households in the Philippines, and 353,600+ homes in over 15 countries with main offices in Philippines, USA, and Colombia. 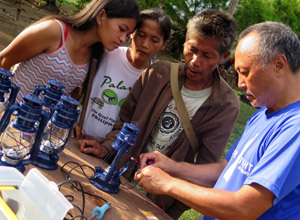 Women's cooperatives now operate building the Liter of Light @Night lights in the Philippines, India, Bangladesh, Pakistan, and Colombia.